There are a series of curves ahead. 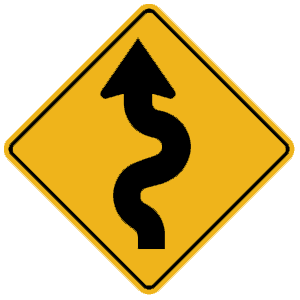 This sign warns of an upcoming winding road with three or more curves. When traveling on a multilane roadway with traffic moving in opposite directions, how should drivers use the shared center lane? To slow down or stop before turning left. As a through-traffic lane when traffic is moving too slowly. The only time a vehicle should enter the center lane is at a point where the vehicle will have time to slow down or stop in order to make a safe left turn maneuver. The center lane should never be used as a passing lane or as a through-traffic lane. Should honk their horn before passing the bus on its left. May continue driving when they think most kids are done exiting the bus. Must come to a complete stop. When approaching a school bus that is stopped on the opposite side of a center turning lane on a three-lane roadway, drivers must come to a complete stop. 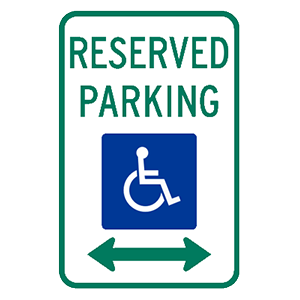 Drivers may proceed when the stop arm is lifted and the lights have stopped flashing. 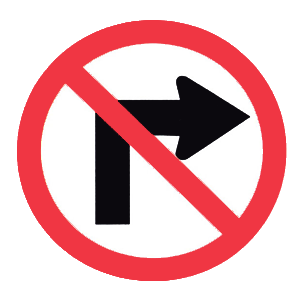 This sign indicates that right turns are prohibited. Do not make a right turn at an intersection where this sign is posted. Which of these statements about pedestrian deaths is (are) correct? I. In cities, two of every five people killed in motor vehicle crashes are pedestrians. II. Most of the pedestrians killed in all traffic crashes are teenagers. In cities, about two out of every five persons killed in traffic killed by motor vehicle crashes are pedestrians. In rural areas, about one in 10 fatalities are pedestrians. What can speed along the process of alcohol leaving a person's system? Nothing. Only time will allow all alcohol to leave a person's system. Approximately 90 percent of the alcohol in your body is eliminated by the liver. It is eliminated at a constant rate and this rate is about the same for all persons: about one drink per hour. It cannot be eliminated any faster. About 38 percent all traffic fatalities involve which of the following? II. More than one car. About 38 percent of all traffic fatalities involve alcohol. Three alcoholic drinks an hour. One alcoholic drink an hour. Two alcoholic drinks an hour. The average person’s body will process one alcoholic drink in one hour. However, many factors play a part in determining how impaired a person will become when consuming alcohol, including the amount of alcohol consumed, how fast it is consumed, and a person’s body weight, food intake, and general health.